Cisco Systems offers a complete range of antennas for access point and bridge equipment that enable a customized wireless solution for almost any installation. 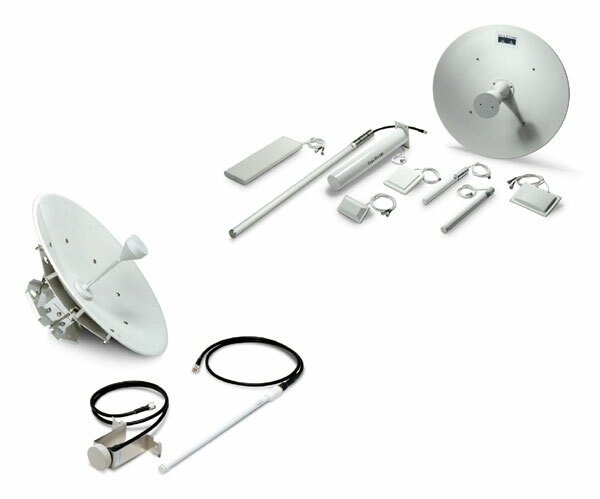 Cisco® Aironet® 2.4 GHZ and 5 GHZ Antennas and accessories complete the wireless solution. Every wireless LAN deployment is different. When engineering an in-building solution, varying facility sizes, construction materials, and interior divisions raise transmission and multipath considerations. When implementing a building-to-building solution, distance, physical obstructions between facilities, and number of transmission points must be taken into account. Cisco is committed to providing the best access points, client adapters, and bridges in the industry-and is also committed to providing a complete solution for any wireless LAN deployment. Cisco has the widest range of antennas, cable, and accessories available from any wireless manufacturer. Cisco offers a complete range of 2.4 GHz and 5 GHz antennas for access point and bridge equipment that enable a customized wireless solution for almost any installation. With the Cisco FCC-approved directional and omnidirectional antennas, low-loss cable, mounting hardware, and other accessories, installers can customize a wireless solution that meets the requirements of even the most challenging applications. Cisco Aironet 2.4-GHz access point antennas are compatible with all Cisco RP-TNC-equipped access points. The antennas are available with different gain and range capabilities, beam widths, and form factors. Coupling the appropriate antenna and access point allows for efficient coverage in any facility, as well as better reliability at higher data rates. Cisco Aironet 5 GHz access point antennas have RP-TNC connectors and are compatible with Cisco Aironet 1200 Series and 1230AG Series access points when equipped with a RM22A radio module. Selection of the appropriate antenna should provide optimal coverage for the desired application in the 5 GHz frequency band. Cisco Aironet bridge antennas allow for extraordinary transmission distances between two or more buildings. Available in directional configurations for point-to-point transmission and omnidirectional configuration for point-to-multipoint implementations, Cisco has a bridge antenna for every application. Low-loss cables extend the length between any Cisco Aironet 2.4 GHz and 5 GHz radio and the antenna with RP-TNC connectors. With a loss of 6.7 dB per 100 feet (30 m) for the low-loss cable and 4.4 dB for the ultra-low-loss cable, this provides installation flexibility without a significant sacrifice in range.